There is river swimming from the river bank(100m) or from the beach at the marina entrance (300m). The property opens onto a grass reserve which runs down to the river. It is a short walk(15 minutes) to Taupo township. There are two large decks with barbecue.One minute to boat ramp. Plenty of activity to watch and tons of room on the reserve for the kids and the active. Cleaning fee of $70.00 applies to all visitors. Handy to town. Modernised, but lovely old fashioned crib. We would definitely stay again. The dogs had a ball, and we relaxed. We love this place. The property itself is 4 stars as it is a true NZ bach not an upmarket home, but we have used it twice now & wouldn't book anywhere else, it suits us & our family perfectly. Awesome location with direct access to reserve and marina and just a short walk to town. Awesome location with direct access to reserve and marina and just a short walk to town. Perfect for kids and dads needing close at hand boat facilities. The house was full or character, offered everything we needed and most importantly whilst enduring a very cold week was lovely and warm. 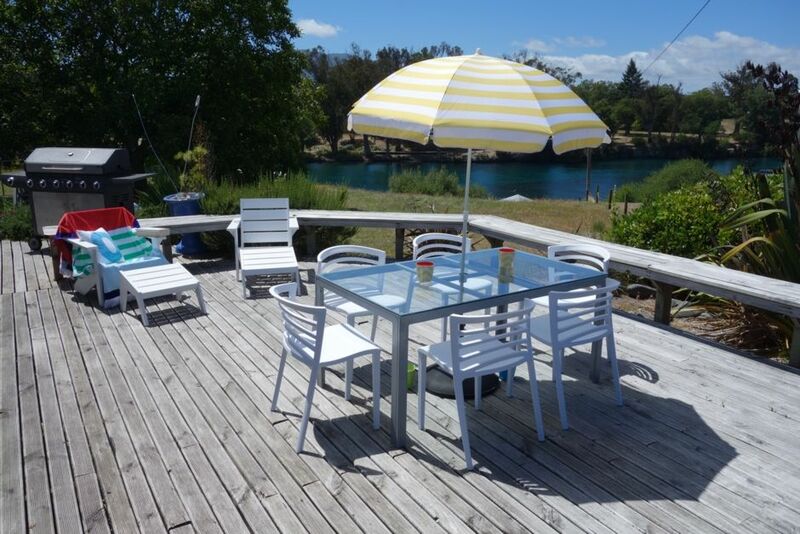 The property comprises a small house and cabin looking out over the Waikato River and its marina and down to the lake. From the deck on the eastern side, there are views of river, lake, Mount Tauhara, and the Kaimanawas. There is river swimming from the river bank (100m) or from the beach at the marina entrance (300m). It is a short walk (15 minutes) to Taupo township. Taupo is at the centre of the North Island’s volcanic plateau and is one of New Zealand’s leading holiday destinations. At the southern end of the lake is the Tongariro National Park. The Tongariro Crossing is recognized as New Zealand’s best one day hike. Turangi is a half hours drive, the Chateau about an hour and Rotorua 40 minutes. Lake Taupo and the region’s rivers boast some of the world’s best trout fishing. The area is the adventure centre of the North Island – bungy jumping, jet boating, whitewater rafting, skiing, kayaking, mountain biking are all available, both commercially, and “do it yourself”. The golfer has a choice of 6 courses. And you can recover by relaxing in the hot mineral springs in the evening. Taupo has an extensive range of eating places- from world class lodges to New Zealand home cooking.